Painting of George Washington and his troops crossing the Delaware River. The commander of the Hessian troops garrisoned at Trenton was Colonel Johann Gottlieb Rall. A Tory farmer attempted to deliver a written warning about the approaching American Army to Colonel Gall on the eve of the battle. Busy celebrating Christmas, Gall stuffed the message in his pocket without reading it. 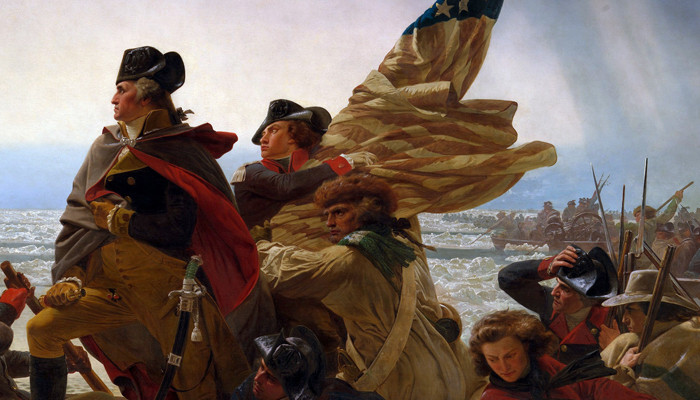 Crossing the Delaware River began at 11 p.m. on Christmas night and was completed at about 3 a.m. on the next morning. Colonel John Glover’s Fourteenth Regiment of Continental Line, a unit largely composed of fishermen from Marblehead, Massachusetts, navigated through swift currents and a winter storm to transport Washington’s army and munitions across the ice-clogged Delaware River without losing a man. Washington had planned a pre-dawn attack, but bad weather and the prolonged crossing of the Delaware River delayed the encounter until about 8 a.m.
Underestimating the threat of an American attack, Colonel Rall neglected to orders to construct defensive works around Trenton. Some of the Continental soldiers marched to battle with with their feet wrapped in rags or with no shoes at all, leaving a bloody trail in the snow. Future American leaders present at the Battle of Trenton included James Madison, James Monroe, John Marshall, Aaron Burr and Alexander Hamilton. Future President James Madison was severely wounded at the Battle of Trenton by a musket ball that severed an artery in his shoulder. Doctor John Riker clamped the artery, keeping him from bleeding to death. Hessian Commander Colonel Rall was killed during the Battle of Trenton. The Tory message warning him of the impending attack was found in his pocket after his death. The Hessian prisoners captured at the Battle of Trenton were paraded through the streets of Philadelphia as evidence of the success of the American Army.